A self-guided, walking tour brochure and app are available that highlight the significant trees of The Ohio State University Oval in Columbus. Trees were selected based on their historic significance, diversity, and ecological and economic values. 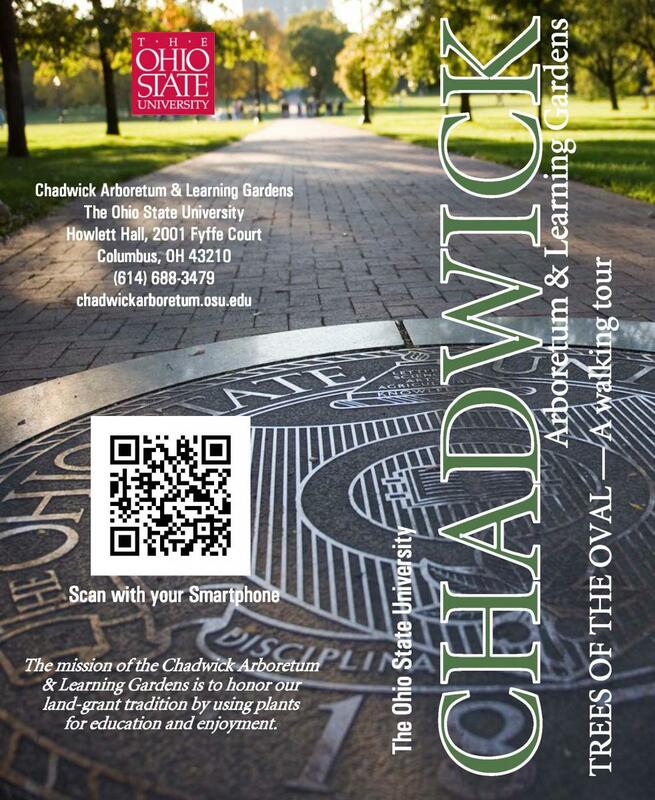 Click Trees of the Oval: A Walking Tour brochure to view or print a pdf of the brochure written by staff and students of Chadwick Arboretum & Learning Gardens. Click Trees of the Oval: A Walking Tour app to access the walking tour app created by the Center for Urban and Regional Analysis at The Ohio State University which was based on the previously mentioned brochure. Whatever your reason for coming to the Oval, a leisurely stroll, enjoying a beautiful day, or having a picnic, you might be surprised to discover an English oak (Quercus robur) thought to be one of the oaks Jesse Owens received from Adolph Hitler after Jesse won four gold medals in the 1936 Olympic Games in Berlin. You might learn the difference between the horsechestnut (Aesculus hippocastanum), a European native, and our native Ohio buckeye (Aesculus glabra). Or you might find the chinkapin oak (Quercus muehlenbergii) that was planted to honor The Ohio State University alumni who served our country during World War I.
Chadwick Arboretum students and staff have calculated the economic value of 32 established trees cited in Trees of the Oval: a Walking Tour. In celebration of Earth Day and Arbor Day each spring, a poster, like the one to the left that illustrates the annual ecological benefit of a tree, is displayed near each of the 32 trees on the Oval. Chadwick Arboretum & Learning Gardens students and staff used i-Tree Calculator software to quantify the many benefits urban forests contribute to our ecological system. They include stormwater management, energy conservation, air quality improvement, and CO2 sequestration. Click i-Tree Calculator for more information about this important software. Stormwater runoff washes chemicals, such as oil, gasoline, and salts, along with dirt or litter found on road surfaces into our streams, wetlands, and rivers. This not only affects aquatic life, but also our drinking water. Trees help with stormwater runoff in several ways. Because tree canopies intercept and slow down rain more water can percolate into soil rather than just flow across its surface, thus, reducing the volume of storm water. Trees also act as reservoirs of storm water by taking water in through their roots and storing it in all parts of the tree. Trees conserve energy. The shade they create helps reduce the amount of heat that a building can absorb and store. Tree canopies slow down wind, which reduces heat lost from a building. By placing trees strategically, these two benefits of trees can keep a building cooler in summer, and warmer in winter. Over 150 million people live in areas where ozone levels violate federal air quality standards. Urban forests absorb pollutants, such as ozone, nitrogen dioxide, and sulfur dioxide, through leaves. Trees also release oxygen as a byproduct of photosynthesis and intercept particulates such as dust, ash, and smoke. CO2 sequestration is the storage of carbon dioxide (usually captured from the atmosphere) in a solid material through biological or physical processes. Trees reduce atmospheric carbon by sequestering CO2 in their entire structure including roots, trunks, stems, and leaves. By reducing energy use as mentioned in the previous paragraph, they help reduce emissions associated with power production. On average, an owner of a mid-sized car drives approximately 12,000 miles yearly, which generates about 11,000 pounds of CO2. Planting trees can help sequester this CO2 and, thus, reduce our carbon footprint. The 32 trees highlighted in our Oval walk are described below. Click Trees of the Oval: A Walking Tour to view or print the pdf version of our brochure. 1. Overcup Oak – Quercus lyrata: This is a rare tree in Ohio. It is one of the species that best survived the floods of the Mississippi River. It is capable of surviving floods for up to 4 months even when its roots are underwater. 2. Willow Oak – Quercus phellos: This is a common street tree. Its native range is from Philadelphia all the way south to Atlanta. It probably received its common name because its leaves are similar to willow leaves. 3. Hedge Maple – Acer campestre: This tree received its common name because of its association with hedgerows noticed by U.S. soldiers in Europe during World War II. 4. Dawn Redwood – Metasequoia glyptostroboides: This tree had been thought to be a living fossil when it was introduced to the U.S. in 1945. However, fossils of it have been found in Pennsylvania coal deposits. 5. European Beech – Fagus sylvatica: As its name suggests, this tree is native to Europe but is used extensively as an ornamental in the U.S. It can be pruned and a row of them can form an attractive hedge, or it can grow into a large tree when left unpruned. 6. Sawtooth Oak – Quercus acutissima: An Asian native, this tree is used for its benefit to wildlife. Unlike other oaks, it produces acorns consistently, and so is not invasive. 7. Oriental Oak – Quercus variabilis: This tree was planted in April 2010 and dedicated on Arbor Day 2010 to honor those Ohio State University scholars who have received Rhodes scholarships. 8. Black Walnut – Juglans nigra: This tree is noted for its valuable wood, large fruit, natural dyes, abrasive cleaner from its nuts' shells, and distinctive flavorful nutmeats. However, its roots release an antagonistic compound that inhibits the growth of some plants. 9. Ginkgo – Ginkgo biloba: Famous for its potent smell, the edible “nut” of a Ginkgo is considered a delicacy in China. It is believed to have health benefits it has been suggested that it may be effective in treating dementia and Alzheimer’s disease. 10. Chinkapin Oak – Quercus muehlenbergii: This Chinkapin Oak was planted to honor The Ohio State University alumni who served our country during World War I. 11. Tulip Tree – Liriodendron tulipifera: The tulip tree is the only tree known to have been planted by Thomas Jefferson at Monticello, and George Washington at Mount Vernon. The trees at both sites are still living. 12. London Planetree – Platanus acerifolia: This species is a cross between an American sycamore and oriental planetree. It was named “London” because it was first identified at the Kew Gardens in London, England. 13. Paperbark Maple – Acer griseum: Paperbark maples were once thought to be sterile. It since has been determined that they are self-unfruitful and require both a male tree and female tree to be present to produce fruit. 14. 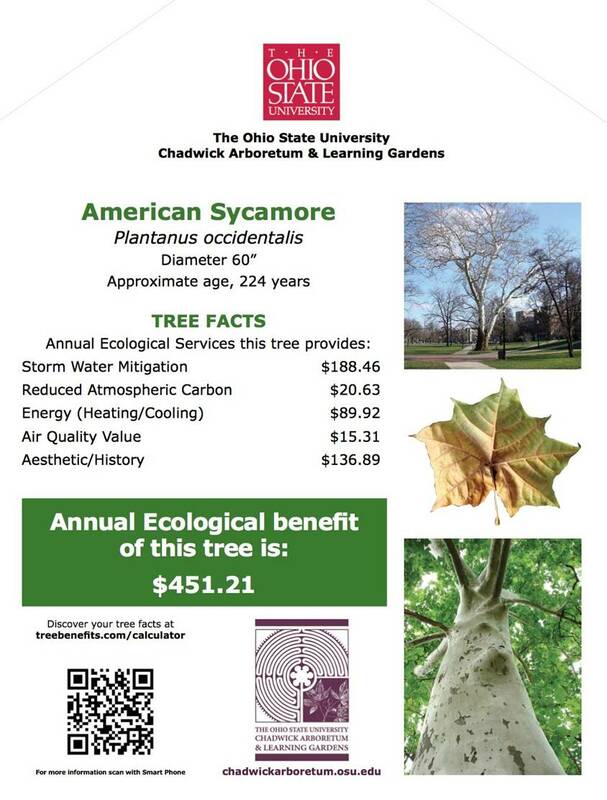 American Sycamore – Platanus occidentalis: On the OSU Columbus campus, the American sycamore is the only tree species that has been here before the university was founded. 15. Chestnut Oak – Quercus prinus: Chestnut oak is a slow growing ridge top tree with the thickest ridged, dark brown bark of eastern oaks. This fire resistant bark protects the tree from secondary, trunk-decay wounds. 16. Zelkova – Zelkova serrata: Zelkova, and Asian introduction, was selected as a replacement for the American elm because of its similar V-shape. Ironically, this V-shape is incredibly susceptible to storm damage. 17. Honeylocust – Gleditsia triacanthos inermis: Thornless honeylocust was the first plant patented by Ohio nurseries in 1949. It has been widely planted as a street tree, although its root system can damage sidewalks. 18. Callery Pear – Pyrus calleryana: Introduced by the National Arboretum in the 1960’s, callery pear is a self-unfruitful tree, so similar to crabapples it can be pollinated by them. It is becoming very invasive. 19. European Ash – Fraxinus excelsior: This cultivar “Golden Desert” was selected for its dwarf configuration, or slower young growth, and yellow twigs. 20. Norway Spruce – Picea abies: Conifers are uncommon to central Ohio, yet this spruce is the best adapted exotic, Northern Europe native. It is very invasive in the Adirondack Mountains, replacing the native White spruce. 21. Crimean Linden – Tilia x euchlora: This is a European hybrid, very similar to the little-leaf linden. It is widely planted as a street tree, and usually grows to a height of 60 feet. 22. Blue Spruce – Picea pungens: In Ohio, the most common seed source for blue spruce is in Kaibab forest, along the north rim of the Grand Canyon. The trees in that environment have needles with a heavy wax coating. This makes trees more salt resistant, which is key in Ohio. 23. Kentucky Coffeetree – Gymnocladus dioicus: The seeds of this tree were used as a “poor man’s coffee” during colonial days. Seeds were roasted to caramelize sugars for flavor and color. 24. Turkish Filbert – Corylus colurna: The native filbert is a multi-stemmed shrub reaching only 8-10 feet. This is the tree form of filberts. It is a popular filbert with woodworkers. 25. European Hornbeam – Carpinus betulus: This is one of several species used to create the hedgerows in Europe. Today they are often planted as windbreaks for crops. 26. Eastern White Pine – Pinus strobus: A native conifer that is very site specific. It does not survive well on grass, so it must have pine needles or mulch under it. It is the state tree of both Maine and Michigan. 27. Sweetgum – Liquidambar styraciflua: It is one of few plants with a split growing range, one in southeast U.S. and one in Central America. The most popular cultivar is the Moraine sweetgum. 28. Bur Oak – Quercus macrocarpa: Bur oak has the largest acorn of any oak in the world, up to the size of a golf ball. Its bark can be up to 6 inches thick, which protects it from natural wildfires. 29. Horsechestnut – Aesculus hippocastanum: A European native, it is often mistaken for the Ohio buckeye. It is more arboreal, slower to grow but will become massive, and is said to be a better ornamental. 30. River Birch. Betula nigra: River birch is native to Ohio, north to Dayton, and commonly found on sandbars. It is very sensitive to iron/manganese contents of soil. A yellowish leaf color results from a soil pH greater than 7. 31. English Oak – Quercus robur: This tree is thought to be one of the oaks Jesse Owens received from Adolph Hitler after Jesse won 4 gold medals in the 1936 Olympic Games in Berlin. 32. Japanese Pagoda Tree – Sophora japonica: This was originally planted as a seedling in the 1960’s. It is an East Asia native that is often found in temple gardens.